I was excited when my Front Porch Pickings this week included baby eggplants. I knew I had to think of something awesome to do with them but I didn't think that making my normal Breadless Eggplant Parm was gonna do it. Instead I roasted them and threw them over pasta, its one of the best meals that I have had in a while. 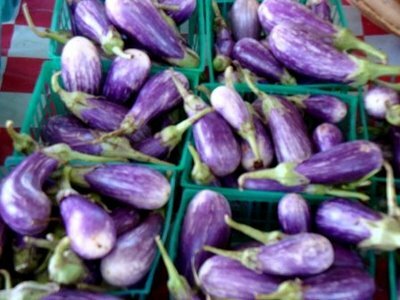 Take the eggplants and cut the stems off and then cut them in half. Take them out of the oven and add more olive oil, six cloves of garlic, bread crumbs and some more salt.